Just as my face is screaming out of thirst, I received box of Love More mask lying on my letterbox, with the kind sponsors from Love More and Secretive.sg. I guess all of us would have heard/tried/known of Love More yeah? And this time, I was been sponsored on their latest launch, the aquamask and its endorsed by a sweet Taiwanese Celebrity, Cyndi Wang. In order to get the perfect and transparent looking skin, other than having a healthy looking and sebum controlled skin, it is important to provide prolonged moisture for your skin underneath too! Most of the toners currently available in the market contain low moisture for your skin and is only a short term solution to quench your skin. If your subsequent skin care products do not contain enough moisture, the moisture will not only evaporate but also evaporate moisture and sebum from your skin. In the long term, the moisture level in your skin will become lower and eventually lead to multiple skin problems. 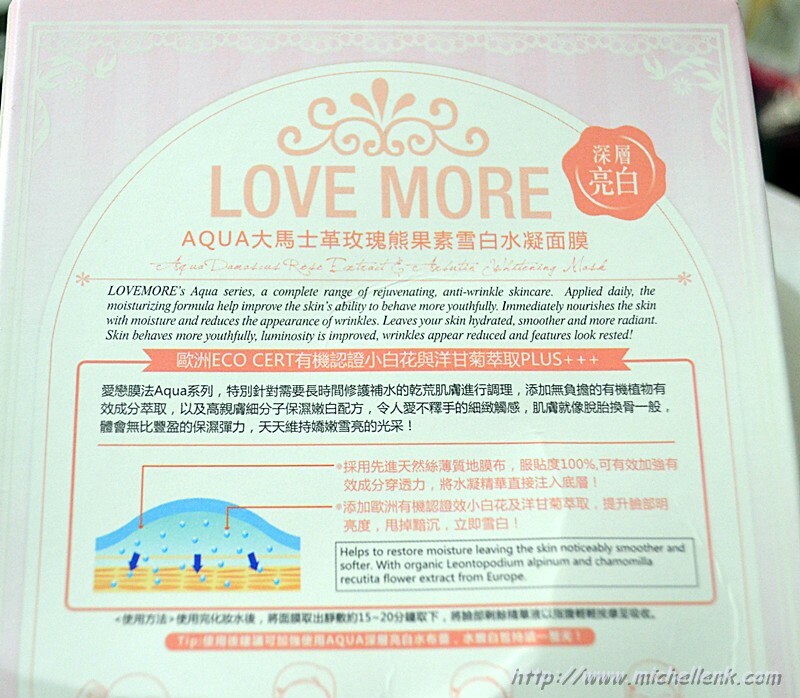 [AQUA Hydrogen Mask] Striking a balance between “skin-friendly water essence” and "fits perfectly on your skin", including peacock ore negative ions into natural silk cotton which is designed to fit the skin tightly without leaving any space which is able to moisture skin with water, moisturises skin and product water. With just 20 minutes, you can feel the elasticity of your moisturized skin! 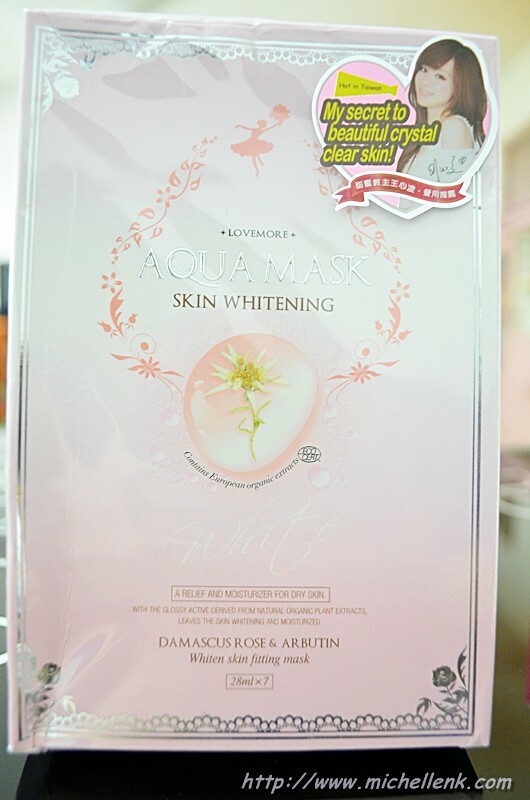 “Flawless transparent skin + 100% Moisturized Skin + Sebum Balance” is what the Aqua Series masks can provide for every female! Specially formulated botanical organic ingredients to target the different layers of skin to moisturized skin, improves the benefits of toner and maintain moisture in your skin the whole day, you will definitely notice the difference after you use it! Helps to restore moisture leaving the skin noticeably smoother and softer. With organic Leontopodium aplpinum and chamomilla recutita flower extract from Europe. What I really love about this mask is the thickness of the mask! 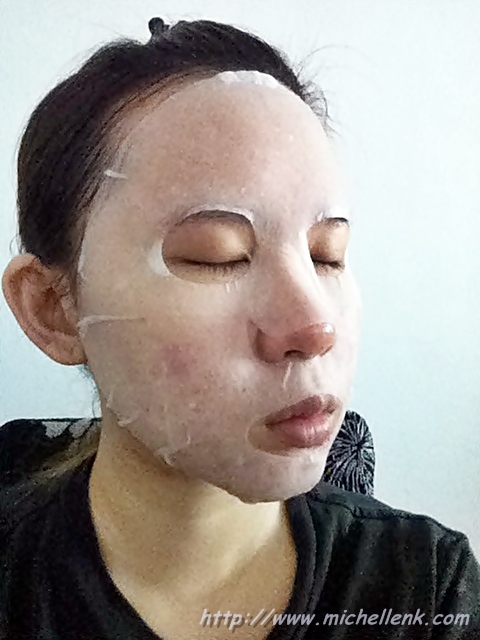 Its really very thin and lightweight that you don't really would feel any thing on your face while applying the mask on. It absorbs quickly and it leaves a slight floral smell on my face after applying. I love how my skin feels after every application. It makes my skin so smooth that I can easily slide my make up on! :) Yes! 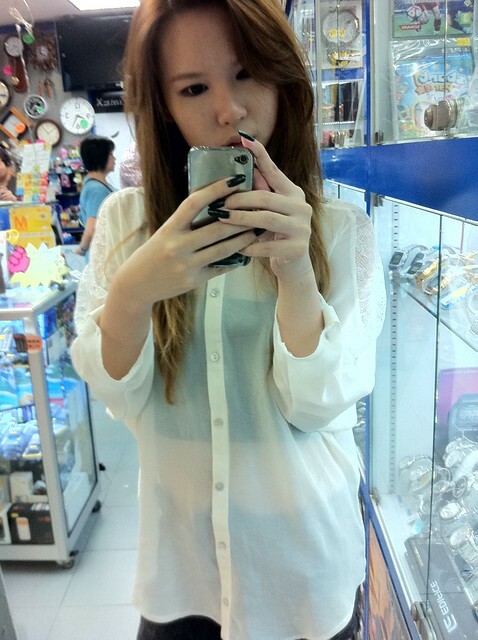 It just make my skin feels so supple like every other of Love More's range does! 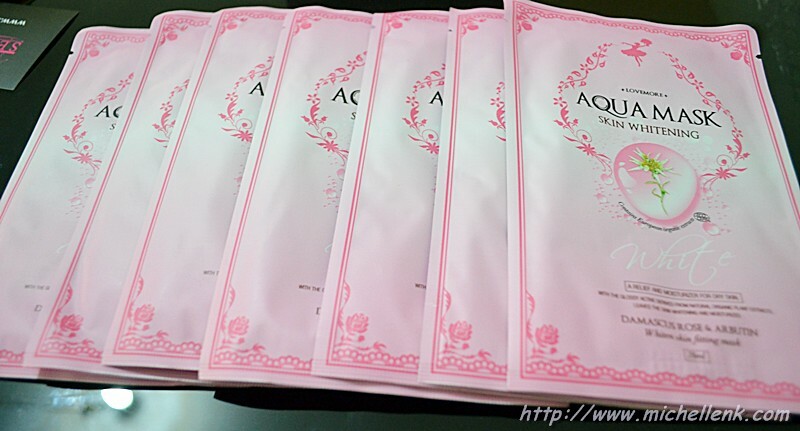 There are actually 2 types of Aqua mask available in the market. I'm using the pink one instead.